A solar cell is a fabricated device that converts the sun’s light into electricity. If we want to get right into it, a solar cell takes the energy from the sun’s light rays, by using the colliding light at the photon level to split apart the electron-hole pairs. When the photon hits the pair, they break, and one part goes north one part south. The stronger the sun, the quicker and more this happens. This process is called the photoelectric effect. The following diagram explains. 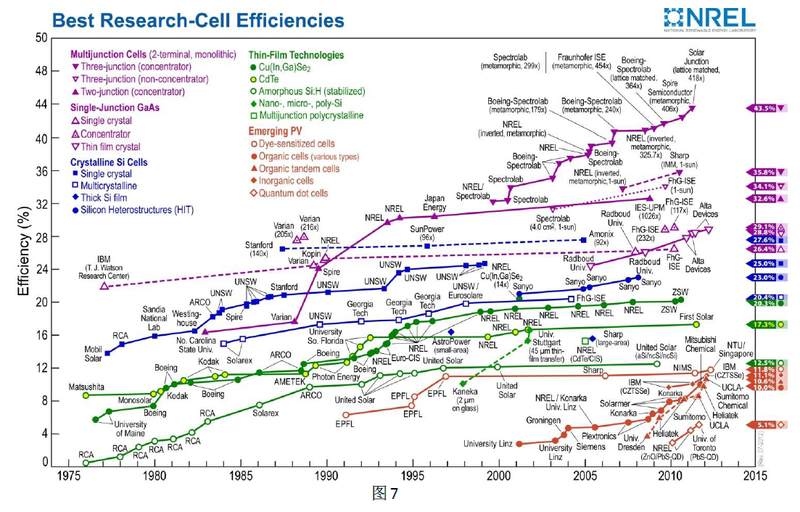 There are many types of solar cells being explored today. The most common are monocrystalline and polycrystalline cells. The monocrystalline cells are harvested silicone, almost like grass except in very clean rooms and it takes a long time and a lot of money. Do you know how long it takes to grow one? Each silicone crystal is then cut into slices like bread, except much thinner, and wired with front and back contacts. Polycrystalline cells are almost the same, except they are not put together in the same way. The grown silicone is then placed into a big bin, smashed up and melted, and then spread thin onto a frame in the shape of the desired cell. You can actually tell by looking if it’s a mono or polycrystalline cell. The monocrystalline cell looks clean and pure. 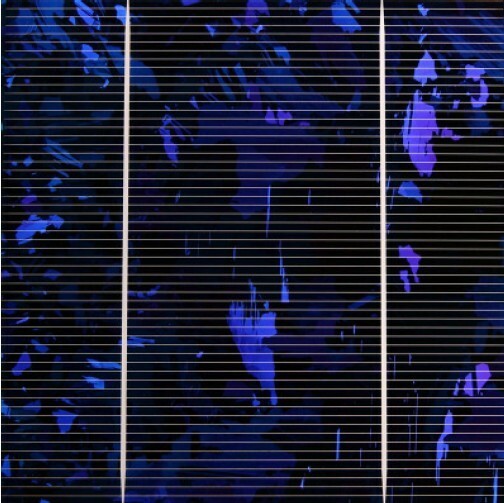 In contrast the polycrystalline solar cell looks like camouflage. 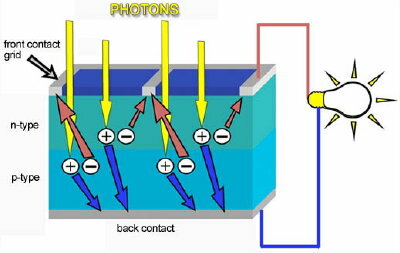 Once the solar cell is fabricated, that is, once it has been either grown or the layers of the solar cell have been deposited onto each other, and you’re looking at a wafer, the front and back contacts need to be added to give the electron-hole pairs a place to go and complete the photoelectric effect… That is, wires need to be added to allow current to flow! This is a place where things get tricky and lots of research is being done, because when the deposition of a metal layer onto a crystal is done, at the boundaries between the two materials a resistance exists that is generally larger than the resistance inside the homogeneous material itself. The research is to reduce this resistance with various theories and tricks. 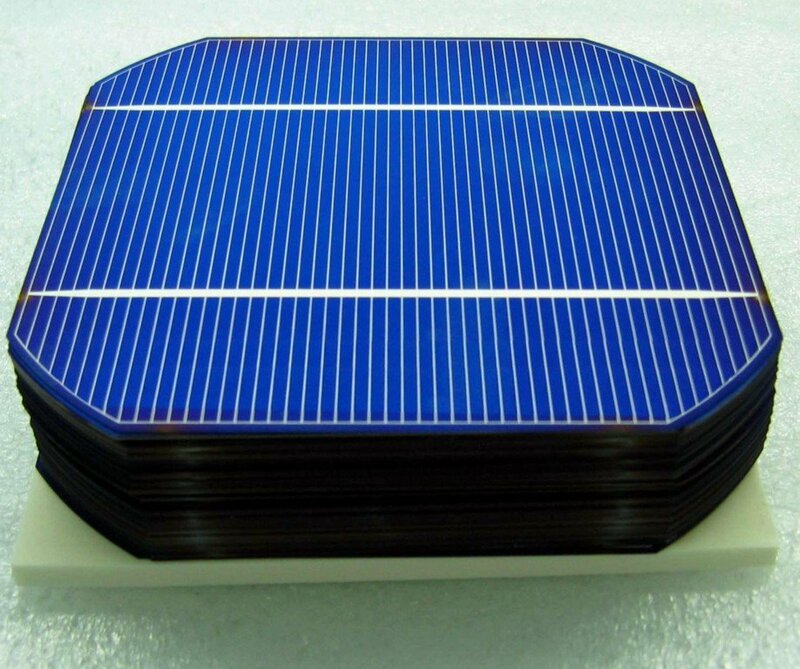 Each solar cell wafer is generally combined into one big solar panel, which is most likely what you buy in the stores. These are usually all wired up, and ready for you to plug into a battery!